Often when we think of memory keeping as crafters, we think of photos and albums. But memories aren't just preserved through photos. Memorabilia helps preserve our memories as well. Including ticket stubs, pamphlets, receipts, notes, etc tells our stories just as well as including photos does. I love to keep bits and pieces from travels, school, etc and I keep them in a large archival safe box. But they're really not well organized and I often struggle with remembering to include them in my album. Enter the Template Studio File Folder Guide! I sorted through my ephemera and determined what size folders I needed. 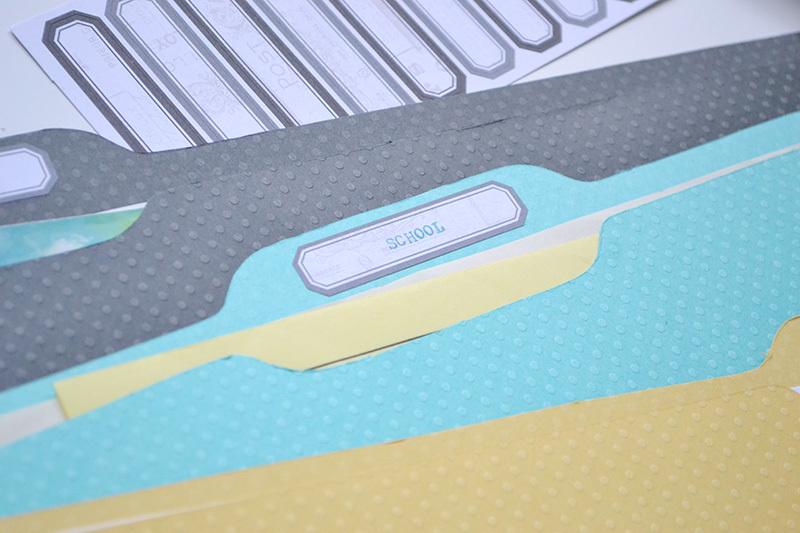 The largest size paper in my ephemera box is 8 1/2 x 11 inches, so I made my folders that size. I divided my ephemera into three basic groups--School, Church, and Travels. You can adjust your categories according to the type of ephemera you have. 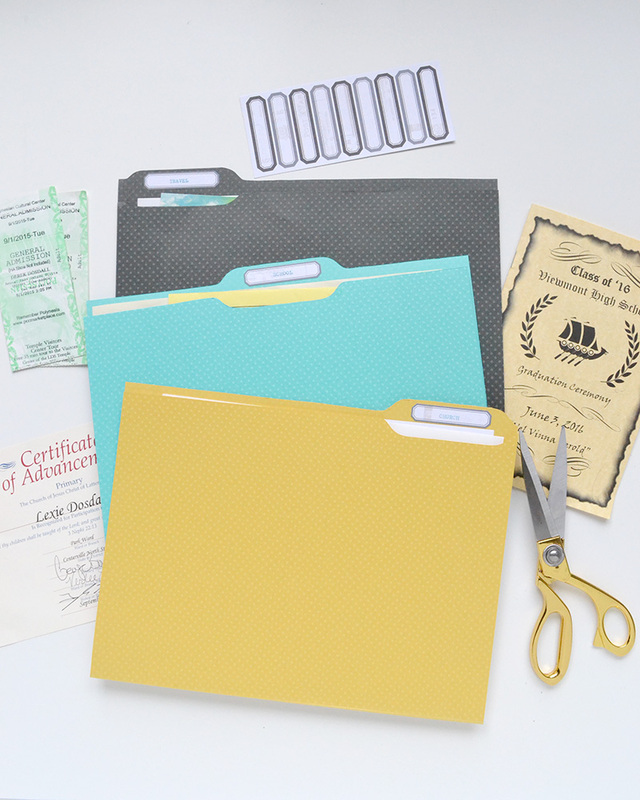 To make the file folders I used three different colors of Bazzill Dotted Swiss Poster Board, the Template Studio Starter Kit, and the Template Studio File Folder Guide. 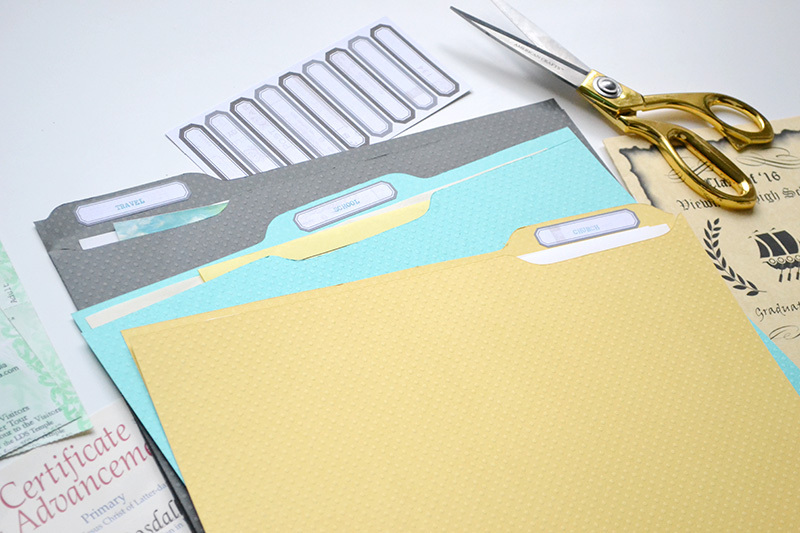 For full instructions to make these custom file folders, visit the original post on the We R blog HERE. To finish off I added the category to each folder using my Typecast typewriter and the labels included in the paper collection. 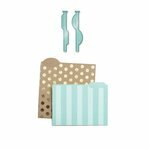 The Typecast labels were the perfect size for these folders, plus the black and grey colors fit perfectly with my color scheme. I'm so excited that I've finally got all my ephemera sorted and organized so it's easier to find when I want to include it in my scrapbook album. And I love that I can create custom file folders in whatever color and size I want using the Template Studio.